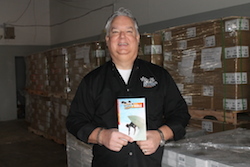 Thanks to the gifts and prayers of many people, 10,000 KiDs Beach Club® Explorer Study Bibles have arrived in North Texas and soon will be in the hands of every child in every Beach Club. Because of this generosity and monthly support of Bibles for Beach Club, thousands of volunteers nationwide will be handing out these Bibles in a celebration called Great Treasure Day in every one of our 144 clubs. On that special day during week 5 of Beach Club in February or March, our leaders will hand out these Bibles emphasizing how special and valuable this book is because it is God’s Word to us and therefore should be considered a treasure that should be treated respectfully. The first verse these kids will read out of their new Bible is Psalm 119:162 which is their memory verse for the day, “I rejoice at Your word as one who finds great treasure.” Our Bible story leader will then have the kids turn to 2 Kings 22-23 where they will see a powerful example of how Josiah found a great treasure in God’s Word. That story will then lead the children into a time of prayer and opportunity to accept Jesus as their Forever Friend. For those who choose to accept Christ, leaders will direct them to one of our special tip-in pages (see below), which points out how to know God and how to pray and ask Jesus into their lives. For many, this will be the very first Bible they have ever received and quite possibly the only Bible in their home. You can help make Great Treasure Day possible for years to come by supporting Bibles for Beach Club. Please consider becoming a monthly supporter and asking a friend to do the same.